Backyards across Lindencroft are under attack by merciless, flower-eating pests! Using your arsenal of trigger-happy lawn ornaments, protective plants, and battle-hardened bugs, help the Smiths to repel and defeat the enemy, one garden at a time. If you like this free game, try Battle Ranch. The sleepy suburb of Lindencroft is under attack, and the Smith Family is the town's only hope! Allen and Laurel Smith have teamed up with their daughter, Charlotte, to investigate the swarms of ravenous critters eating the town's flowers, and stop the pests before it's too late. Help the Smiths by deploying a wild arsenal of lawn ornaments, bug-fighting plants and other oddball inventions to stop the threat in the Smith's backyard and beyond. Place your items around the garden, then watch them fight the enemy. With the money you earn for defeating the pests, you can add more defenses, or upgrade the ones you have to be bigger, better, stronger, and weirder. Research new, more effective ways to protect your flowerbeds. 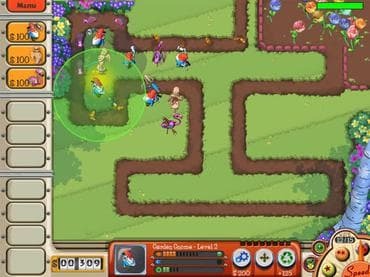 With each garden that you rid of enemies, you draw closer to unraveling the mystery of the hungry bugs. Do you have the nerves to withstand an onslaught of ferocious fruit flies, aggressive ants, and slimy slugs? Can you plant a spitting sunflower without losing an eye? Do you have the right screwdriver to attach a rocket launcher to a garden gnome? Then join the battle, and master Garden Defense! If you have questions about Garden Defence game, please contact us using this form.